Equipped with wit, intellect, and an innate curiosity about people and places, John Hanson Mitchell strolls through Boston’s streets, chronicling the nonhuman inhabitants and surprisingly diverse plant life, as well as the eccentric characters he meets at various turns. Using his modern observations as a starting point, he tells the fascinating stories of the tribal leaders, naturalists, community activists, and organizations who worked to preserve nature in the city over generations, from the Victory Gardens of the Fenway to the expansive woods of Franklin Park. But much of the history is in the land itself. As he battles traffic on notorious Route 128, Mitchell considers the ancient origins of the rocks that line the highway and those that form the city’s foundation. A walk across Boston Common calls to mind the Tremount Hills, flattened by seventeenth-century newcomers; only Beacon Hill remains. A stroll through the Back Bay allows Mitchell to imagine the Charles River, so polluted by sewage that it became a public nuisance and was partially covered over with a massive nineteenth-century landfill. With this natural history in mind, Mitchell explores both ancient and new green space from Chelsea to South Boston, including the greenway formed by the Big Dig. Endlessly readable and full of personality, The Paradise of All These Parts offers Boston visitors and residents alike a whole new perspective on one of America’s oldest cities. "In a lively, engaging style, Mitchell shows how the changing urban landscape and local legends have shaped this historic city." "John Hanson Mitchell's The Paradise of All These Parts sees the 'city upon a hill,' Boston, as a place of constant discovery, even today . . . a worthy guide to the city's natural spaces, but he is at his best in making his readers think anew about a place they think they already know." "One of my favorite New England writers is John Hanson Mitchell . . . [h]is new book . . . [is] an intriguing blend of geology, biology, political science, and personal anecdotes." 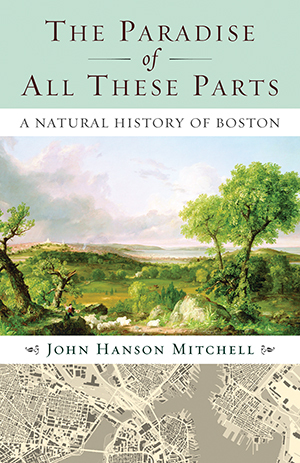 "Littleton author John Hanson Mitchell explores Boston's natural history and explores a variety of habitats in his 10th work of nonfiction, The Paradise of All These Parts. He ranges outward from the core, the peninsula where the Pilgrims first settled to the ancient rim of the Boston Basin, where the modern city now lies. Mitchell will speak in Lowell at Pollard Memorial Library on Tuesday, Oct. 21, at 7 p.m., and festival organizer Rob Mitchell says he'll delve into all the natural parts that remain in urban landscapes and Lowell's in particular. 'He has a nice sense of humor and will tie the book into Lowell's natural history in an interesting way,' said Rob Mitchell." "[H]e is a smart guy, walking around, paying attention. I'd name his genre nostalgic realism; Mitchell certainly knows where this city and its many peculiar institutions come from, and he understands modernity as well. [T]his book will take its place next to Walter Muir Whitehill's 'Boston,' with engravings by Rudolph Ruzicka, as one of the treasured Hub tomes of our time."